Secure space application is a mobile wallet solution that enables you to store all your private information in one place. Secure Space is available for Windows Mobile and Symbian Series 60 devices. You have access to five pre-fabricated lists: Expenses, Credit Card, Banking, Password, Custom Lists. You can create any custom list or editing pre-fabricated lists. There are no restrictions on the type and the amount of lists. 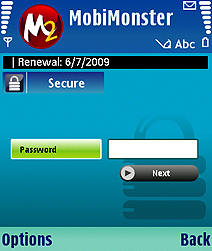 MobiMonster Secure space application is a mobile wallet solution. ...... There are no restrictions on the type and the amount of lists that you can create. Not only can you create new lists but also edit the pre-fabricated lists to create, expand or manage them. This application screen is password protected and enables you complete freedom to perform any actions including creation of expenses lists which can be of any length. Secure space application is an advance mobile wallet solution that also stores your data in private folders (for symbian devices) which ensure that no third party application can view data on your device. Download a free trial for this application for 20 files and see how it can help you preserve all your data in one place. Qweas is providing links to MobiMonster Secure Space (Mobile Wallet) 2.0.0 as a courtesy, and makes no representations regarding MobiMonster Secure Space (Mobile Wallet) or any other applications or any information related thereto. Any questions, complaints or claims regarding this application MobiMonster Secure Space (Mobile Wallet) 2.0.0 must be directed to the appropriate software vendor. You may click the publisher link of MobiMonster Secure Space (Mobile Wallet) on the top of this page to get more details about the vendor.